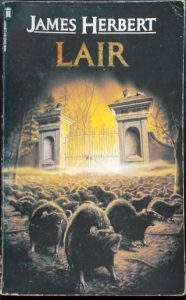 You don’t necessarily have to have read The Rats before you can read Lair, but having read both books I would recommend it, unless you are only intending on reading the one book. And why would you want to do that? If you want to read Lair, then read The Rats first. Trust me. You will enjoy a better read—two better reads. Lair takes up the story four years later. The rats are vanquished—at least everyone believes so—but the control of vermin is taken a lot more seriously, for obvious reasons. Lair has a different central character than The Rats, a rat-catcher named Lucas Pender. Pender wasn’t in the first book. In fact, the only character that I remembered from the first book was Pender’s boss Stephen Howard, who played a big part in orchestrating the rat’s defeat first time round. His involvement then has written him a ticket into a high powered job at Ratkill. Everyone might have dared to hope that the danger was over and that the rats were no more, but they have been wrong. The surviving rats have relocated. The city was the place of their defeat and so they have left London and decided to partake of a little country air. Of course county air is very good for helping to work up an appetite and old habits die hard. The rats are just as savage this time around and perhaps a little smarter too, so Pender has his work cut out for him. The two headed mutant rats also make a return and are, if anything, even more obnoxious than ever. So if The Rats gave you nightmares, and you decided never again, you had best stick to that thought. But if you do you will be missing out on one hell of a read. One of the things that makes Lair such an interesting read, for me anyway, is the politics of some of the situations. It rings very true of the real world. For instance, at one point early on in the story, Pender wants to evacuate Epping Forest and has good reasons to do so. The Superintendent of the forest goes against Pender’s advice though and states all kinds of political and financial reason for keeping the forest open. Pender has eyewitnesses who have seen the rats, he has samples of the rat’s droppings and more bloody evidence. He sticks to his guns. Unfortunately for Pender, and everyone else, the superintendent gets on the phone, pulling strings, and pulls the carpet out from underneath the rat catcher in his efforts to brush everything under it. Until the killing spree starts that is. Lair is a good read. The characters are believable, the situations seem believable and so do the rats; and that of course, is where the nightmares begin. So if you happen to live in a cottage, in the woods, and hear all sorts of noises in the night, from the wildlife outside your home, perhaps this one might not be your best choice for bedtime reading.